“Jim was in tears and I will admit that I was sniffing some myself when the old man got through. Somehow I had forgotten that he did not have on a tuxedo suit, somehow the fact that he had on a slouch hat instead of a plug, slipped out of my mind, and all that I remember and realize was that he was a true Mason. His name is John. He has wild hair, wears a T-shirt with holes in it, jeans and no shoes. This was literally his wardrobe for his entire four years of college. He was at the top of his class. Kind of esoteric and very, very bright. He became a Mason recently while attending college. After moving to his new town, he finds down the street from his new apartment is a well dressed, very conservative Lodge. One day John decides to go there after work. He walks in with shoes, jeans, his work shirt, and longer hair. The Lodge has already started and so John starts looking for a seat. The Lodge is completely packed and he can’t find a seat. By now the Brethren are really looking a bit uncomfortable, but no one says anything. John gets closer and closer and closer to the East and, when he realizes there are no seats, he squats down right on the carpet. (Although perfectly acceptable behavior at a college fellowship, trust me, this had never happened in this Lodge before!) By now the Brethren are really uptight, and the tension in the air is thick. About this time, the Secretary realizes that from way at the back of the Lodge, a Past Master is slowly making his way toward John. Now the Past Master is in his eighties, has silver-gray hair, and a three-piece suit. A good man, very elegant, very dignified, very courtly. He walks with a cane and, as he starts walking toward this boy, everyone is saying to themselves that you can’t blame him for what he’s going to do. great difficulty, he lowers himself and sits down next to John and welcomes him so he won’t be alone. Personal caring, one Brother to another, is what makes us a fraternity-and a family. He was short, heavy, and frowned a lot Some said he was a troll, others characterized him as a leprechaun. He was irascible, irritating, and sometimes loud. He had a penchant for complaining and finding fault. He boasted of having “taken a demit” every time the Scottish Rite raised its dues over the past 50 years, but he never explained how he managed to remain a member in order to exercise his proclivity for demitting. He once cast a vote against a dues increase, only to offer (during new business) personally to pay $15,000 to pave the Lodge parking lot. He wasn’t stingy; he just enjoyed complaining. For 50 years, he was successful at getting under the skin of just about every Master. Then Henry was diagnosed with Alzheimer’s. The disease worked quickly Soon, the Lodge was in charge of his care, a 24-hour-a-day duty almost immediately. Henry lost weight, mobility, and comprehension. In a matter of months, he became a child of three. Delivered to the Lodge one evening too late for a formal dinner and informed of his tardiness, he stood in the doorway weeping like a child who had missed a birthday party. The tables and chairs had already been stacked and put away by the stewards. Henry still stood at the door, his shoulders heaving with each breath. Wasn’t someone going to do something? Are we a fraternity? And if so, what does that mean? Are we a family, or do we just go through the motions? Do we stand for anything real, or do we just mouth the words? The ghost of Masonry Past stood silent witness to the events and was ready to cast judgment. Well, maybe it does work! Maybe we mean what we say. Maybe we really are a family of Brothers bearing some responsibility for each other. Little events like this one will determine the truth of the matter, not the words of a catechism. Robert E. Waterton, Sr. was raised in El Cajon Valley Lodge No. 576 in 1972 (Master in 1988), became a 32( Mason, Valley of San Diego, in 1984, K..: C.: C.: H.:. in 1991, and 33( 1.: G.: H.: in 1995, A member of the Grand Lodge of California’s Speaker’s Panel since 1987, he was Grand Chaplain of the Grand Lodge of California 1989-90, and Chairman, Grand Lodge Education Group, 1991-92. Presently, Personal Representative, Valley of San Diego, he is also a member of the York Rite Bodies, Al Bahr Shrine Temple, ONES., Order of the White Shrine of Jerusalem, So. California Research Lodge, Scottish Rite Research Society, Joseph L. Shell Daylight Lodge No. 837, The Philalethes Society, The Royal Order of Scotland The Robert the Bruce Association, York Rite College, and National Sojournes/Heroes of ’76. I was traveling on business, and since I had a free evening, I decided that it would be nice to visit a lodge while I was there. I made arrangements with the Secretary, and when I arrived he greeted me, looked at my dues card, and invited me to have a seat. He told me that they might open lodge a little late. The Master was coming from work, and he was delayed a little, but on his way. No problem, I settled into one of those darned theater seats, and waited. After a bit, this guy walks in, with a three-day growth of unshaven beard, dressed in a t-shirt, cut-offs and flip-flops. He shakes a few hands on the way in, and hurriedly approaches the Masters’ Station. No one seemed fazed, but I was a little puzzled. The guy puts on the Master’s apron, jewel and hat, picks up the gavel and starts to open the meeting. I had to admit that the meeting was so well conducted that I almost forgot about the way he was dressed. After we closed, the Secretary came up to me and apologised for not letting me know that the Master was an under-cover cop, and usually came to lodge directly from his assignment (whatever it was), and they never knew what he would look like. But he was such a great leader, and such an inspiration to the members at how he lived and breathed Masonry, that they just didn’t care what he was wearing. After all, we tell ourselves that it is the *internal* and NOT the *external* characteristics that mattered, right? I guess that lodge did more than pay lip service to that. They lived it. They figured out what was really important. Chuck was a young Black man, when he was raised in a Prince Hall Lodge in New York City. He learned his lessons well, but always wondered if others really did. As a young Black man, especially living in New York City, he had seen some incidents of people treating others badly. Were Prince Hall Masons unique? Did New York (Caucasian) Masons really believe in the Brotherhood of Man under the Fatherhood of G-d.
Chuck fell in love with, and married, a beautiful white woman. On their honeymoon, they were traveling in the Deep South, in a motor home. Deep in the middle of a VERY rural town, they ran out of gas. Stranded on the side of the road, with no gas station, or house, in sight, Chuck started to worry. So did his wife. A Black man, with a White woman, stranded by the side of the road in the deep, rural, South. Remembering the lessons taught him, and being in real distress, Chuck began giving the Distress sign he was taught to the few passing motorists, hoping to come to the attention of a Prince Hall Brother, or anyone, who might be able to help him. Time went by, and evening was beginning to set in. A station wagon approached, and Chuck started giving the sign. Much to his alarm, and that of his wife, the station wagon was occupied by three White men, and there were white sheets (could they be robes?) in the back. Now, Chuck was worried. VERY worried. “You a Mason, boy?”, the driver asked, in that wonderful southern way. “Yes sir, I am.” Chuck replied carefully. Chuck got the gas can, and he and his wife got in the car, scared out of their whits. Were they being helped, or were they going to be lynched? Happily, the driver took them to a station. They filled the can, and the driver asked the owner of the station if they could borrow another. The station owner looked at Chuck. And at his wife. They filled the second can, returned to the motor home, and emptied the cans into the tank. “Even two gas cans worth of gas wouldn’t go very far in this thing”, Chuck worried. The station wagon followed Chuck and his wife to the station, made sure that they had no trouble filling up and returning the can, and drove off to their meeting, their white sheets (robes?) undisturbed in the back of the station wagon. Chuck never again wondered if the lessons taught in Masonry were lost on anyone. By Gene Goldman, with Morgan P.
This is the true story about my friend, and dear Brother Mason. We will call him Morgan. Morgan was a college student when this story started, while a member of the U. S. Army ROTC. Morgan was, and still is, a follower of Wicca (a religion influenced by pre-Christian beliefs and practices of western Europe that affirms the existence of supernatural power and of both male and female deities who inhere in nature). As a Wiccan, Morgan believes in a Supreme Being and strives every day to maintain a good relationship with Deity. In October of 1993, Morgan applied for the Degrees of Masonry to a Lodge in the town where he was attending college. As is the requirement in that Masonic jurisdiction, he was elected by a unanimous ballot. Two months later, in December of 1993, he was Initiated an Entered Apprentice Mason in that Lodge (we will call it his First Lodge). In February of 1994, after passing a suitable proficiency, now Brother Morgan was notified that he would be passed to the Degree of Fellowcraft on the 5th of March, 1994. So far, our Brother’s progress in Masonry is no different than any other Mason who has gone that way before. Nor should it have been. Brother Morgan applied of his own free will and accord, met all the requirements, was found Worthy and Well Qualified, and came Well Recommended. On that basis he was Initiated an Entered Apprentice Mason. On the eve of his Second Degree, on the 4th of March, 1994, Brother Morgan was notified that he would not be taking his degree the next day. He spoke with the Master of the Lodge, who advised him that it was only a temporary delay. Then, the Master started asking questions about Morgan’s beliefs. Brother Morgan had answered those same questions before, while being investigated prior to being elected, and in a more abbreviated form during his Entered Apprentice Degree, a mere two months earlier. As Wicca is not as well known as many other religions, he happily confirmed that he did, and does believe in a Higher Power. Brother Morgan graduated from University in May of 1994, and at about that time he was directed to apply to do courtesy work at home. No particular reason was given. Brother Morgan was very busy with post-graduation matters until early in 1995, when he applied to do courtesy work. The Master of his lodge reported to the lodge that Brother Morgan had told him he was a “tree worshiper” and “non-believer in a Supreme Being”. Because of that lack of understanding of Wicca, the Master informed Brother Morgan that he would not be allowed to advance in Masonry. During this time, there was a very active Masonic community that frequented the Masonic forum on a site called CompuServe. Several of us (yes, dear reader, I was active in the forum) were past Masters, many were not, but one was far more well-known that any of the rest. At the time, Allen E. Roberts was the most prolific living Masonic author. His works are still available on Amazon, as well as any Masonic supply house. Brother Allen was also a gifted educator, and one of the most respected Masons in the US. He was also a dear friend, and we who knew him deeply miss his gentle nature and truly Masonic character. Brother Allen was a true Gentleman. Safely rest, my dear Brother. In 1995, Brother Morgan joined the forum, seeking advice about his options. A half dozen (or so) of the forum members (including myself) offered Brother Morgan advice, and even more offered their sympathetic support. One of the more useful pieces of information was the name and address of grievance committee chairman in his jurisdiction. But some of us did something more. We began privately discussing (what we saw as) this injustice, and the unanimous feeling was that we should do something. Brother Allen announced that we WERE going to do something, and while he kept the details to himself, he began making phone calls. An unconfirmed rumor has it that he offered to write a book about how religious bigotry has no place in Masonry. And that he considered Brother Morgans experience an excellent case study. While we were discussing potential strategies, and Brother Allen was also making his phone calls, Brother Morgan contacted the Grand Lodge Grievance Committee. While Brother Morgan was beginning his active duty service to our country (at MP school), the committee requested a written explanation of his Wiccan beliefs. He provided one, and included an FAQ from the Pagan Student Union at a local university, along with related excerpts from the US Army Chaplain’s Handbooks. The Grievance Committee deliberated for a considerable period, and finally, in 1996, they recommended to the Grand Master that Brother Morgan be approved to advance in Masonry. Happily, the Grand Master agreed, and instructed the lodge to strike any record of the objection. Because Brother Morgan was now living in Washington DC (still serving our country), he asked a local lodge for assistance with the courtesy work. That lodge was unable to assist, but a nearby lodge provided the assistance, Passed him to the Degree of Fellowcraft in June of 1996, and Raised him to the Sublime Degree of Master Mason a month later, in July of 1996. It took Brother Morgan over three years to do what most US Masons do in three or four months. Later, Brother Morgan affiliated with a third DC lodge. In April of 1997, Brother Morgan made a trip back to his first lodge in order to attend a special annual meeting, but was informed that if he showed up, the Master would cancel that special meeting and name Brother Morgan as the reason, now asserting that Brother Morgan made false statements to the Grand Lodge Grievance Committee. Brother Morgan moved to Massachusetts in April of 1997. He affiliated with a lodge there and was appointed Chaplain in September of 1998. He was elected Junior Warden of his new lodge for the 1999 term. Still serving in defense of our country, Brother Morgan was deployed to Bosnia in 2000, and continued into 2001. Returning to his new lodge in the fall of 2001, he was promptly elected Senior Warden. The following Masonic year, in 2002, Brother Morgan was installed Worshipful Master of his lodge. After a number of years, Brother Morgan received a political email from an officer of his first lodge, using the lodge email list (including their Grand Master and Grand Secretary), with the lodge address as the sender. Brother Morgan replied to the email, saying that he believed political email under the banner of a Masonic lodge was inappropriate. This generated a response from the individual who Initiated Brother Morgan as an Entered Apprentice Mason years earlier, saying never to contact him again as Brother Morgan was “not a true mason” and had lied. A true Mason, Brother Morgan continues to pay his dues to his first lodge to this very day. Visiting other lodges, particularly in different jurisdictions, is wonderful, and I have made it a point to do so whenever opportunity presents itself. But visiting is NOT what Masonry is about and a Mason who never visits a lodge other than his own is NO LESS a Mason than one who has visited thousands. I find it sad, beyond words, when men who say they have received the Three Degrees of Masonry only think of it in terms of who can visit where. Sad because it seems they have completely missed the whole point. Masonry is (designed to be) an Initiatic experience, that helps highlight the importance of Morality and Ethics in every aspect of a Mason’s life. What part of that has anything to do with visiting another lodge? I know many fine, distinguished Masons, from Entered Apprentices to past and present Grand Masters. And we all know of countless more throughout history. Not one has EVER distinguished himself by visiting another lodge. They ALL have distinguished themselves because of the moral and ethical character they have borne, and how they exemplified their character throughout their lives – in and out of Masonry. You don’t have to visit another lodge – or even sit in your own – to do that, and visiting a lodge (or sitting in your own) does not frequently even give you an opportunity to do that. My advice to those who say they are Masons but get their underwear all in a twist about who can visit where is to go back to those Three Degrees you received and really study them. Really understand how much of those Degrees are about visiting and how much is about morals and ethics. Maybe that will help. He came to this country, and learned some English along the way, from SouthEast Asia, as a teenager. When he was a young adult he applied for membership in my lodge. I was serving as Master at the time. One of his investigators mentioned that he didn’t seem to know much about the fraternity, but seemed like a nice enough guy. Not an unusual situation, so I planned to assign him one of our more thorough coaches, to make sure he was taught properly. I never considered the cultural aspects at play. Imagine the situation here. We had two candidates that night. He was the second, so he waited in the lobby with our Tyler, a retired Marine Corps Gunnery Sergeant (who looked every inch the part). Of course, our Brother Gunny had his Tyler’s Sword prominently displayed, as is the custom. Our young friend seemed to take special note of the big brute of a Marine with the sword who stood watch over him. The Stewards and Marshall came out to take the first candidate into the preparation room. Visualize this: our friend is being guarded by a Marine with a sword. Out come two more big guys with spears (actually, they are ceremonial staffs, but they do look deadly) and a guy with a billy club (we call it a Baton, but you get the picture). The three armed guys take the first candidate into the preparation room. The big Marine, and his sword stayed with our friend, like he was guarding him. The Tyler said he never heard a peep and did not see how, but when they came back out to get our friend, he was nowhere to be found. This is a true story, and happened while I was serving my Lodge as Master. As Master, I blame myself. I should have taken this young man aside and talked about the symbolic nature of our ceremonies. About how everything has a meaning, and that at no time would he ever be in any danger or even be made uncomfortable. I should have told him that all these symbols are presented strictly for their moral and ethical implications and none should be taken at face value. They should be appreciated for their personal meaning. I should also have shown him around the Lodge Room before we opened that evening. I should have done these and other things, but I didn’t. And it haunts me to this day. So, every opportunity I get, I share the symbolic nature of our ceremonies, and how they are intended to create a transformational experience that will bring the individual from who he is to who he wants to become in a moral and ethical context. I have adapted the Lodge Walkabout guide I found to use with applicants. It takes only a few minutes and allows them to feel much more comfortable. Especially with a candidate who is less familiar with us and what we do. Masonry is a beautiful system of morality, veiled in allegory and illustrated by symbols. Have you heard that before? Etymology: in sense 1, from Late Latin symbolum, from Late Greek symbolon, from Greek, token, sign; in other senses from Latin symbolum token, sign, symbol, from Greek symbolon, literally, token of identity verified by comparing its other half, from symballein to throw together, compare, from syn- + ballein to throw. Within the context of Masonry, definitions 2 and 5 are most applicable. A symbol is something that we can all see, hear, feel or otherwise sense that serves to remind us of something more personal within ourselves, and about which we may have stronger feelings. 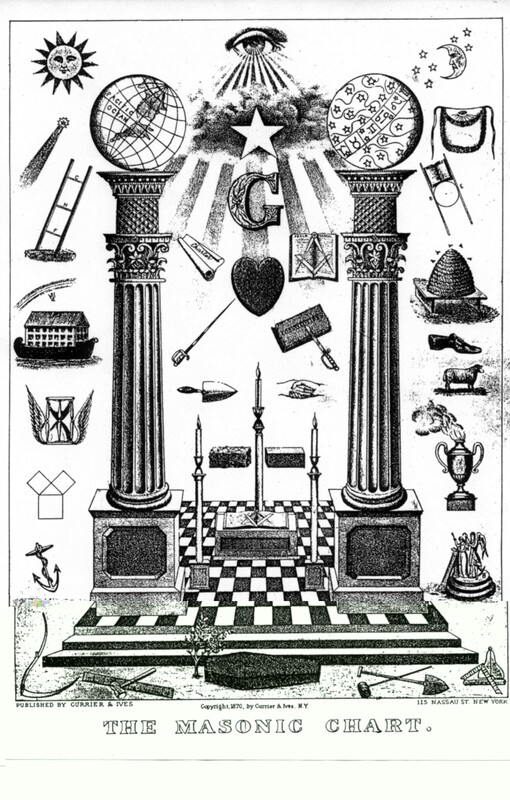 The symbols in Masonry represent the morality, the ethics, and the values we (as Masons and as individuals) hold dear. They remind us to observe and practice them. They remind us to keep them important in our lives. More than that, the symbols inspire us to reach new heights, strike out in new directions and set new goals. All in a Masonic – that is MORAL – context. There are many ways to consider an object. Two of the most used in Masonry are literally and symbolically. Let me take the Letter “G” as an example. In one of our lectures, we pay respects to the letter in the East. A literal consideration would be that we are respecting the letter, or the physical object mounted on the wall. This, of course, is nonsense. The seventh letter of the English alphabet is not deserving of our particular notice, as a letter. However, a *symbolic* consideration (and the one that actually describes what happens in the Masonry that exists in the real world) is that we are paying respect to what that letter *represents* – Our Divine Creator. This respect, we pay *through* the symbol. Everyone is able to agree that the letter *represents* Him, even (particularly?) when we do not agree on what He looks like, what Name He is best known by, or how best to worship Him. Because we use a symbol, instead of a literal, we do not have to agree on the details. Similarly, when considering the many references to His Holy Word in our ritual, we use them symbolically (in most cases), not literally. Yes, there are some *historical* references, and those, I submit, are literal. The ones about King Solomon’s Temple, in particular. However, the rest are strictly symbolic. Equally applicable to Christian, Jew, Muslim, Hindu, Wiccan, Buddhist and anyone I have inadvertently omitted. For example, those references to the individual’s own Holy Writings. In that same manner, references to anything in our laws, rules and regulations are necessarily literal,, uniform and specific. There is a sharp and noticeable distinction, an obvious point of demarcation, between what is fact and what is fiction in our ritual. Throughout our Degrees, certain terms are used. When someone says, “Sacred History teaches us”, or “The great Jewish Historian Josephus informs us” or a similar term, the lecturer is about to refer to an item of historical or religious fact. What he is about to describe is the way it was, or what happened. But whenever he says “Masonic Tradition informs us”, you can bet that what you are about to hear is an allegory, a fable, completely fictional. It is a symbolic teaching and not a historical lesson. An illustration of this would be that it would make no difference in what we teach if the letter “G” was replaced with “A” for Architect, “D” for Deity (as done in some jurisdictions), or (as is most common outside the USA) there were no letter within the Square and Compass at all, and we simply symbolized our devotion to The Most High by the representation of His Holy Word atop the altar. The lesson would not change. However, our law is very clear. The letter “G” cannot be replaced with an “A”, nor with a “D”, an “H”, a “J” nor a “K”. It cannot be removed. It cannot be lower case. Fortunately, because ritual does not affect law, and law does not affect ritual, the possible contradictions that might arise from this do not occur. Our ritual is what it is, and exists to instruct our minds and inspire our spirits. Our law is what it is, and exists to bind our behavior and regulate our actions. It would make no difference to the fabric of our nation if it turned out that George Washington’s dad never owned a Cheery Tree. The allegory would hold, even if it were based in fiction. Similarly, it would make no difference to Masonry if Hyram Abiff were not in fact slain, but lived to complete the Temple, got a performance bonus from Solomon, retired on a nice pension and spent his twilight years touring the world in his motor home. The lessons taught would be no less valid. We would be no less Masonic. In fact, it is most likely that the legend of the Third Degree is fiction. Scripture does not record a murder during the building of the Temple. Such an act would almost have to have been recorded, particularly the murder of one in so important a position as “Architect of the Work”. Even if a murder had been committed and somehow gone unrecorded, the body would not – COULD not – have been reduced to ashes. Cremation did not exist, and Jewish law specifically forbids it anyway. Nor could the body have been buried “near the Sanctum Sanctorum”. Jewish law required that cadavers be buried without the gates of the city, and the Temple was Hallowed Ground. The point here is that it doesn’t matter if the Legend is based on fact or fiction. It is allegory. It’s basis doesn’t affect it’s validity in our Craft. A symbol, when properly used, has greater value when it’s exact definition is personal, individually-determined, and most meaningful to the one considering it. Like words (which are in themselves symbols), symbols mean different things to different individuals, in different contexts. Where there is general agreement, there is also communication. Ideas, particularly moral and ethical ones, can be communicated much more effectively, in my experience, when they are symbolically represented. Masonry uses symbols – of that there is no question. What do we *DO* with them? Besides “illustrate moral and ethical principles”, I mean. I am coming to understand that Masonry does define the symbols it uses (most of them, anyway). But the definitions are only in the most general terms. The Plumb signifies that we should ever remember to walk uprightly. The VoSL that we should always look to our Divine Creator, and His Teachings (as given to us in His Holy Word) for guidance and support in all our undertakings. The beehive that we should be industrious, and so on. Nowhere that I can find, in any of the symbols or teachings in Masonry, is there more than the most general definition. What does it mean to “walk uprightly”? Which Holy Book should we use to learn about, what Name should we use to refer to The Great Architect? What form should our industry take? All these, and other, questions are left for the individual to determine for himself, in the context of his life, as he finds best. There are no instructions and no judgments. Does patriotism mean voting for or against this issue? Is it my duty as a neighbor to advise the folks next door that their back-yard target practice is bothering the neighbors, or is it my duty to call the cops and have them restore the peace and good order of the neighborhood? Does Brotherly Love mean that I should loan my friend the money, or is it better to help him find a job? Should I draw a card or stand pat? Masonry stands mute on all these, and similar issues. All Masonry does, really, is remind us that we are to find ways of causing true friendships to exist among those who might otherwise have remained at a perpetual distance. Masonry encourages us to practice Brotherly Love, Relief, Truth, Faith, Hope, Charity, Respect, Temperance, Fortitude, Prudence and Justice. It does this, largely, by presenting us with symbols, inspirational reminders, of these ideas. However, HOW we are to do those things are left up to us. How we will interpret the symbols is our decision. What actions we will undertake, or not, is left to our own election. A physicist sees a practical demonstration of the refraction of light across the visible spectrum. An Old Testament scholar sees a reminder of the covenant G-d made with Noah. A New Testament scholar sees a reminder of the fulfillment of the promise of a Deliverer. A child sees pretty colors. A storyteller sees a leprechaun protecting his pot of gold. An artist sees brilliant hues and gorgeous transitions. A meteorologist sees the end of a long rain. All of them are looking at the same rainbow. It is objectively measurable. Everyone sees the same thing. We all agree what we are seeing, hearing, etc. We agree on the shape, color, size, location and so on. The rainbow as an object does not vary. The interpretations men make of it, when seeing it as a symbol, however, will. Masonry shows us rainbows, and asks us to consider what they mean, what we see in them. Different people will see different things in the same rainbow. A red light will mean different things in different contexts to different people. A photographer see it as a signal that a developments process is under way. An actor sees it as an indication which camera is currently on. A cop sees it as a means of traffic control. A machine operator sees it as a signal that power is on. A vice cop sees it as an indication that prostitution is happening. A kid sees it as a sign that a holiday is approaching. Having said that, it IS important to remember that the *law* (as distinct from the meanings of the symbols) is clear that when someone operates a motor vehicle, he agrees to abide by the rules. Among those rules is one about stopping at intersections where a red light is displayed. Failure to stop may mean being cited for an offense, or even that physical harm may come to someone. These would not be good things – so we drivers enter into a social contract to abide by the rule, or suffer the penalties. But abiding by a rule, and agreeing with an interpretation of a symbol are COMPLETELY separate matters. No contradictions, no interaction. The number Three is one of the most important numbers in Masonic symbolism. I would like to address just one (for now) aspect of it’s meaning. In the lecture of the Second Degree, we say that Masonry is divided into Two sections – Operative and Speculative. I would submit that in adopting a symbolic approach to teaching, and the inclusion of so many symbols into our Craft, it is really Three parts (like the 24” gauge). Operative, Speculative and Applied. The Operative Masonry provides us with our history (real or symbolic), the Speculative gives us the impetus to discover and develop our own interpretations of the symbols, and the Applied pushes us forward, out into the real world, to make our contributions to it. We make those contributions not only out of our G-d given talents, but out of the added value of our Masonry – Veiled in Allegory and Illustrated by Symbols.